Fairy Tales hair care products use only the finest ingredients such as aloe, Vitamins A,D and E, rose hips and citrus extracts in our shampoos, conditioners and detanglers. Rosemary Repel Hair Care has been shown to prevent head lice – naturally. Our products are all natural, organic and safe to use everyday. The first of its kind, this unique shampoo uses organic rosemary, citronella, tea tree, anise, lavender and geranium oils to help repel lice and other insects from the hair. Enriched with vitamins and minerals, this great shampoo contains no harsh chemicals so it's mild enough to use every day. Promotes soft, shiny and squeaky clean hair. Perfect for all hair types. Paraben and SLS free. Rosemary Repel Crème Conditioner combines lice protecting ingredients such as organic rosemary, citronella, geranium, tea tree, cherry bark and passion flower with nourishing aloe and vitamin E. No need to rinse out completely just comb thru for tangle free hair. Rosemary Repel Crème Conditioner will not create build up and leaves the hair silky and smooth, soft and shiny. Paraben and SLS free. Fairy Tales Hair Care #1 product is the Rosemary Repel Leave-in Conditioning Spray. This ground breaking formula blends organic oils of rosemary, citronella, tea tree, lemongrass, peppermint, sage and others to help keep lice and other insects away. Loaded with vitamin B-5 and aloe, Rosemary Repel Leave-in Conditioning Spray detangles, conditions, and seals and protects the hair from unwanted elements. This is the MUST have product to use EACH morning before school, day care, and camp. Spray the hair, neck, behind ears and tops of shoulders for maximum lice prevention. Proven to be over 92% effective when used alone and nearly 100% effective when combined with our other Rosemary Repel lice prevention products. Paraben and SLS free. Infused with organic rosemary, citronella, tea tree, anise, cinnamon, mint, sage and geranium oils, this great gel is the final step to help repel lice and other insects from the hair. Our alcohol free, lightweight gel is the perfect styling tool to not only create cool looks but it helps keep the bugs away, too! Paraben and SLS free. 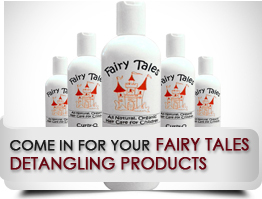 Fairy Tales Lice Good-Bye™ Mousse is a revolutionary new product to help remove lice and their eggs (nits). This is a nontoxic, pesticide free, enzyme based mousse that is safe and effective. For stubborn outbreaks, upgrade to the best selling nit removal comb, the Terminator Metal Comb. The grooved, metal teeth are extremely close together to remove more nits efficiently and quickly. 1 4 oz. bottle per order. 2-3 applications per bottle, good for 1 school age child. Includes 1 plastic egg removal comb. These are our Sun & Surf products. Perfect for avid swimmers and beach-goers. This extra strength formula removes chlorine, salt water and minerals from the hair. Loaded with fruit enzymes and citrus extracts. Deep cleans and moisturizes hair. Removes chlorine "green" from the hair gently and completely. Can be left in for 3-5 minutes for extra cleansing. CoCo Cabana Leave-in Sun Spray is a rich conditioner in a spray pump to help keep hair conditioned and manageable. Take it to the beach and re-apply often for beautiful, easy to manage hair! These are our Tear Free, Detangling, AND Styling products. Curly-Q Natural Curl Maker is a great non-sticky gel for kids of all ages! This lightweight shampoo is perfect for all types of curls. Deep cleans, moisturizes and helps make curls pop! Tear Free and so mild. Loaded with Vitamins E and B to restore shine and texture while gently cleansing the hair. Safe for babies and toddlers, too! Detangles and cleans with extra rich super charge ingredients! Infused with jojoba and aloe vera to leave hair silky soft! Energizing Leave-in Conditioner nourishes hair while detangling. Eliminates frizz and moisturizes. A daily conditioner that cleans and moisturizes in just seconds – all with no greasy buildup. Extracts of rosemary, aloe vera, cherry bark and chamomile leave hair feeling like silk. Static electricity no more! Rehydrates the scalp with pure vitamins and no greasy buildup. Enhances luster and pliability with aloe, rose hips, sage and Vitamin B. Finally, a DEET free Bug Repellent that actually works! Studies have shown that oil of lemon eucalyptus and soybean oil are nearly as effective as DEET in protecting against mosquitoes commonly found in the United States. Non-toxic, pesticide and chemical free, Bug Bandit safely and effectively repels mosquitoes, flies, fleas and other insects. Natural ingredients such as rosemary, citronella, lemongrass, peppermint, cedar bark and cinnamon are blended with soybean oil and other natural ingredients to moisturize and provide long lasting protection against bugs. Use it every day outdoors on the playground, camping and on vacations. Sleep-Tite Bed Bug Spray is an EPA exempt bed bug treatment proven to kill bed bugs and their eggs. 97% effective rate with only 1 Spray! Contains no pesticides or chemicals and is safe to use around children and pets. Perfect for your home, college dorm, and camp bunk. Take one along on your vacation so you can…Sleep-Tite and don't let the bed bugs bite!